USADA announced today that a sole arbitrator from the Court of Arbitration for Sport (“CAS”) rendered his decision in an appeal that sought to challenge the start date of track & field athlete Mohamed “Mo” Trafeh’s sanction, as earlier determined in the Award issued by the American Arbitration Association (“AAA”) on December 2, 2014. The CAS Award vacated the AAA Award start date of January 1, 2012, for Trafeh’s 4-year period of ineligibility and instead commenced the start date on December 2, 2014, the date of the AAA hearing decision. Accordingly, Trafeh’s period of ineligibility, which was due to expire on December 31, 2015, will now continue through and include December 1, 2018. Trafeh, was found guilty by the AAA of committing multiple rule violations, including the repeated use and possession of erythropoietin (“EPO”) and evading sample collection. At that time, the AAA arbitrator determined that, in accordance with the rules of the World-Anti Doping Code (“Code”) and International Association of Athletics Federations (“IAAF”) Anti-Doping Rules, Trafeh’s multiple violations and other conduct qualified as aggravating circumstances. Consequently, a 4-year period of ineligibility was imposed as well as the loss of results dating from January 1, 2012, which includes a U.S. 15K National Championship, U.S. Half Marathon Championship and a record-setting U.S. 25k National Championship. 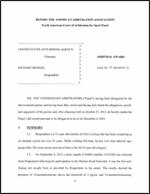 Based on the ruling of CAS, Trafeh remains disqualified from all competitive results obtained on and subsequent to January 1, 2012, including forfeiture of any medals, points, and prizes, through the conclusion of his period of ineligibility.